Inspire your students to be theoretical thinkers, innovative advocates, and agents for change. Focused on cultivating the next generation of scholars, this highly respected classic demystifies theory, charts strategies to use in developing and advancing theory, and provides tools and best practices in evaluating progress in the discipline. Based on the feedback of nursing students, this edition was updated to be more accessible without losing the necessary rigor to foster critical thinking. 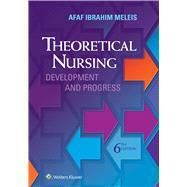 Meleis provides a developmental and historical review of theoretical nursing and helps readers develop analytic skills and integrate knowledge into a coherent whole. By embarking on the journey of nursing theory, practicing nurses will find ways to improve everyday practice, as well as develop theories that capture their expertise. New online journal articles and case studies give students an opportunity to apply theory to practice. Chapter-ending Reflective Questions expand students’ understanding of theory and its impact on nursing today. Separate chapters covering Middle Range Theory and Situation-Specific Theory. This text is complemented by and frequently used with Peterson & Bredow’s Middle Range Theories: Application to Nursing Research and Practice. A new two-column design that enhances readability. Doody's Review Services gives this title a Weighted Numerical Score: 89 - 3 Stars!